Harsh time can only create a harsh character. She was not the only one who survived. I am just wondering how she never lost her creativity. Never, ever… This is what for I admire this woman, a poet and a fighter. And really I do not care about, what love affairs she had and with whom: women, men, or at one time, with both genders. It does not matter for me, indeed. She never hurt anybody, and her sexual orientation is and was of her own business. The important thing for me: Marina Tsvetaeva was a great poetess and a decent human being! To the right is my digital contribution to the image of Marina Tsvetaeva’s poetry, still lovely and desirable for all who loves poetry and beauty. 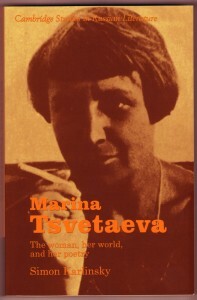 At the top left is a portrait of Marina Tsvetaeva from the front cover of the book about her. I am glad that my universal humanitarian point of view on activities of the people, first, and life style,second, is shared with me.The appreciation of Marina Tsvetaeva’s poetry was shown to me recently as one example: the street in the village of Zagorodny of Sterlitamaksky District of the Republic of Bashkortostan is named after Marina Tsvetaeva.That is her popularity which increases with the years to come.